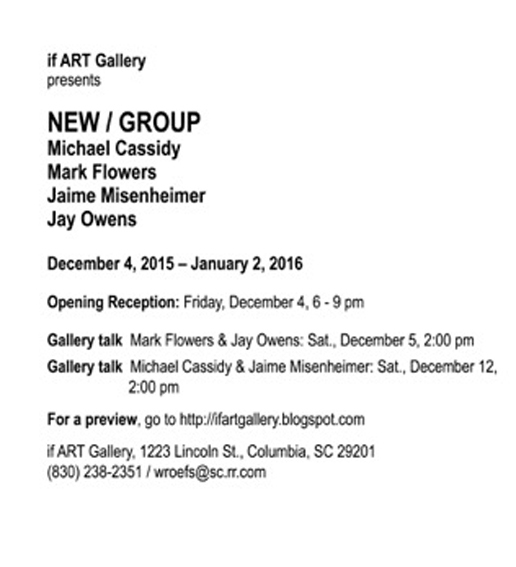 I’m pleased to be part of a four-person exhibition to be held at if ART Gallery in Columbia, SC next month. This is one of the strongest contemporary art galleries in the Southeast. Frequent stops in to see what’s new won’t disappoint and the New Group Exhibition promises the same. It’s an honor to be included. We would love to see you at the opening. You can preview the work at the if ART Gallery website. Below, and on the site, you will see a schedule of gallery talks by all four artists. The opening reception is on Friday, December 4, 6-9 pm. IF ART GALLERY IS OWNED AND OPERATED BY WIM ROEFS. CONTACT THE GALLERY AT WROEFS@SC.RR.COM OR 803-238-2351. A contemparary art gallery showing established, mid-career and young artists from South Carolina and beyond – including the Netherlands and Germany.